The combination of these three starts has left Leake with an unspectacular 5.7 K/9 and 5.7 BB/9. His 3.92 ERA might be enough for owners in some leagues to buy into him, but his 4.78 xFIP could leave owners in savvier leagues passing on Leake. Still, I feel as though this Reds rookie has some very redeemable qualities. While some might consider Arizona State RHP Mike Leake an overdraft at eighth overall, I don’t; I think that’s an excellent pick. He has very good stuff, and his excellent pitchability makes it all play up. Additionally, after watching some video and taking a cursory glance at the PITCHf/x data from his first three games, I’ve kind of fallen in love with Leake’s stuff. He doesn’t throw very hard, but he’s got a very good sinker that will induce plenty of ground balls (as his 57 percent GB% to date suggests) and a good sinking change-up that should do the same (both with good horizontal movement as well). He also mixes in a cutter, slider, and curve. The slider is insane, getting more than 5 inches of horizontal movement. Very few pitchers are able to generate that kind of movement on their sliders. It’s probably not quite at the level of a Zack Greinke or CC Sabathia or Jake Peavy, but it is quite good (and in terms of actual effectiveness, it’s generating 22 percent whiffs—roughly what Greinke got on his last year). His curve also seems to be a bit of an underrated pitch, generating between 5 and 10 inches of both vertical and horizontal movement. The combination of good stuff paired with the scouts’ raves about his pitchability tells me that, yes, Leake does indeed appear to be ready for the big leagues despite not having thrown a pitch in the minors yet. His stuff is very conducive to generating ground balls, and his secondary offerings should allow him to post an above-average strikeout rate. 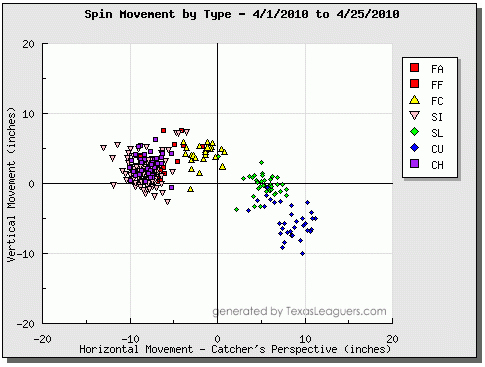 Because scouts have always made note of his stellar control, and because he showed this during his most recent outing, I’m not going to freak out about the 5.7 BB/9 thus far. He’s also been able to find the strike zone at a slightly above league average rate thus far (49.7%), which should only improve and, at the very least, paints a rosier picture than his BB/9 does. Oliver sees Leake posting a 3.68 ERA the rest of the way, and while that might be a little optimistic, an ERA around 4.00 (with significant upside) certainly seems attainable. I bought Leake during the first week of the season in both LABR and Tout Wars, and I’ll continue to start him and expect good things. While I’d take a guy like Colby Lewis over Leake, you might have a hard time finding a better under-the-radar pitcher available on your mixed league waiver wire. And if he’s still somehow available in an NL-only league, go get him now. Where were you a week ago Derek? I picked this guy up in both of my Keeper leagues the day before they announced he was in the rotation. My leaguemates go googoo over pitching prospects so once the hype started I traded Leake and Dallas Braden for Jay Bruce in one league and traded Leake and Jeremy Guthrie for Justin Masterson in another. Hoping the early sell doesn’t come back to haunt me! I wouldn’t sign Leake yet in anything other then a keeper league, or a somewhat deep NL-only league, but he definately is someone worth keeping an eye on. I think he’ll show flashes of what he’s capable of doing this year, but I think it will be at least a year before he really becomes a viable fantasy option. Love the article. In a rare move, I picked up Leake immediately following his first start after simply watching the highlights on MLB. Didn’t know anything about him, but he looked in control (despite the walks) and seemed extremely poised for someone with no minor league experience. Could very well get rocked a time or two this season, but he looks polished and ready to pitch well. To date I think he has the only “W” on the Reds staff, which says more about the Reds than Leake probably. Could you forward your article to Dusty Baker? Thanks for the comments, Peter. Leake’s change has been coming in at around 83 and his sinker 89.